Structured products in the form of equity-linked derrivatives have seen a rapid rise in popularity in the field of wealth management. Structured products are combinations of derivatives and traditional financial instruments such as stocks and bonds. The various components are combined into a single financial instrument and securitized. Discusses the characteristics and practical applications of structured products. 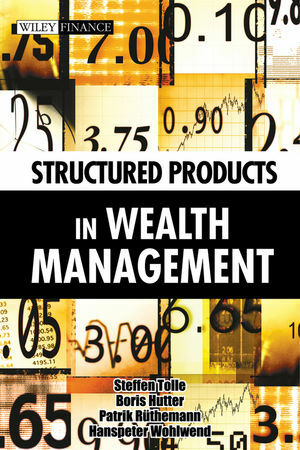 In addition to providing a description of the structured products, this book focuses on their practical applications, showing how they can generate added value as part of an integrated investment process. Colourful charts help present the material in an attractive, real-world context. Dr. Steffen Tolle studied business administration at the University of St. Gallen, majoring in finance and accounting. He completed his PhD in 1993 with a dissertation on "Dynamic Hedging Strategies with SMI Futures." After joining Wegelin & Co. Private Bankers in 1991, he took over as head of Products and Trading in 1996. He has been a managing partner since 1999. Today he is head of Advisory and Wealth Management at Wegelin & Co.
Boris Hutter joined Wegelin & Co. Private Bankers in 2001 after studying economics at the University of St. Gallen with a major in finance and capital markets. he is involved on a daily basis in the launch of new structured products. Patrik Ruthemann, CFA, studied business administration at the University of St. Gallen. After completing his studies he joined the Structured Products department of Wegelin & Co. Private Bankers in 2000. Today he is head of Products and Trading and became a managing partner in 2007. Dr. Hanspeter Wohlwend studied business administration at the University of St. Gallen, Majoring in banking. In 2001, he completed his PhD in financial market theory at the same university with an empirical study of the Swiss market for structured products, Since 1995, he has held various positions at Wegelin & Co. Private Bankers, including head of Investment Process and Portfolio Management. Today he is responsible for the bank's Operations as a managing director. Differences between forwards and futures. Differences between certificates and mutual funds. The market for structured products. The lifecycle of structured products. Chapter 3. The Investment Process. Overview of the investment process. The concept of risk/return classes. Strategic asset allocation definition of investment segments. Chapter 4. Using Structured Products in Wealth Management. The use of structured products in the core portfolio. Constructing the core portfolio with traditional investments. Tactical optimization of the core portfolio. The use of structured products in the satellite portfolio. Nominal versus effective exposure: "unbundling".